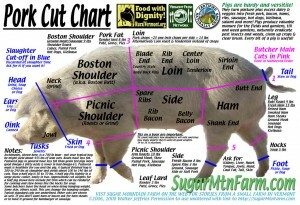 This is how it works: we deliver the pigs to the butcher, they call you and take down your butchering instructions. When your meat is ready, they will call you again for pick up. Fresh meat is available about a week after the butchering, and smoked or cured items like ham and bacon are available about two weeks after butchering. You will pay two bills: first, Blue Heron Farm will bill you for the hog itself ($3 per pound for whole hogs, $3.15 per pound for half hogs). Then you will pay the butchering costs to the butcher when you pick up your meat. The final cost varies, but here’s the bottom line: all orders will come in between $4 and $5 per pound. 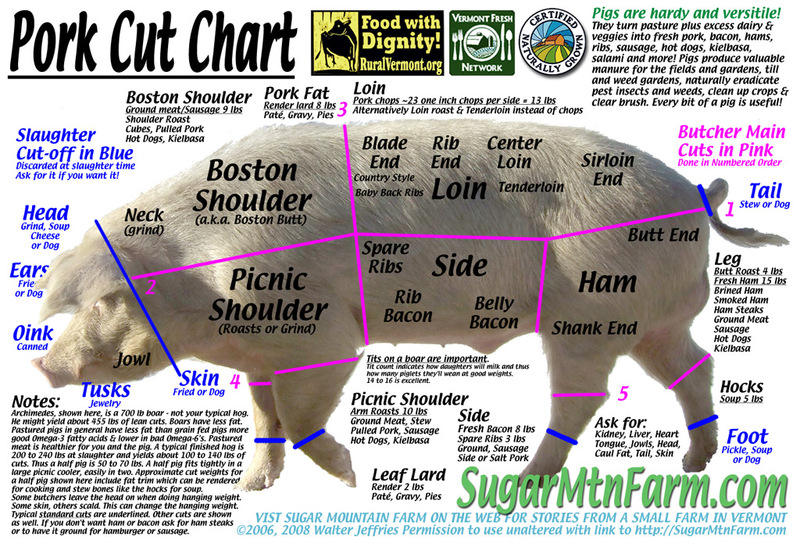 For a half hog, you will take home approximately 60-85 pounds of meat and you will pay a total of $300 – $390, depending on the size of your half hog and the type of meat you choose to order (smoked meat costs more to process than non-smoked, organic spices are more expensive than non-organic). We are happy to provide more details if needed! We work with Homestyle Butchering in Middlebury. Their address is 59989 E County Line Rd Middlebury, IN 46540, 574.825.4602. Please consider these estimates or guidelines. If you’re a visual person, this handy chart may help you picture what comes from where – click for the full-size version.